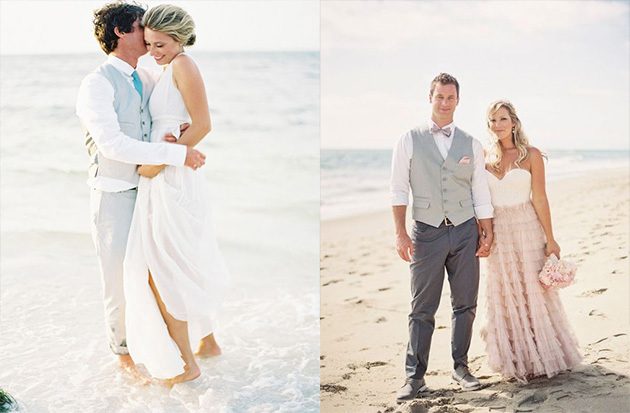 Nowadays, beach wedding theme is the latest fashion catching up couples. For the couple who are aspiring to make the wedding event, memorable beach theme wedding is perfect to go with. It is running at the top in youths and people who are going to commit in a new relation, beach wedding theme is a stunning idea to celebrate the occasion with fullest. 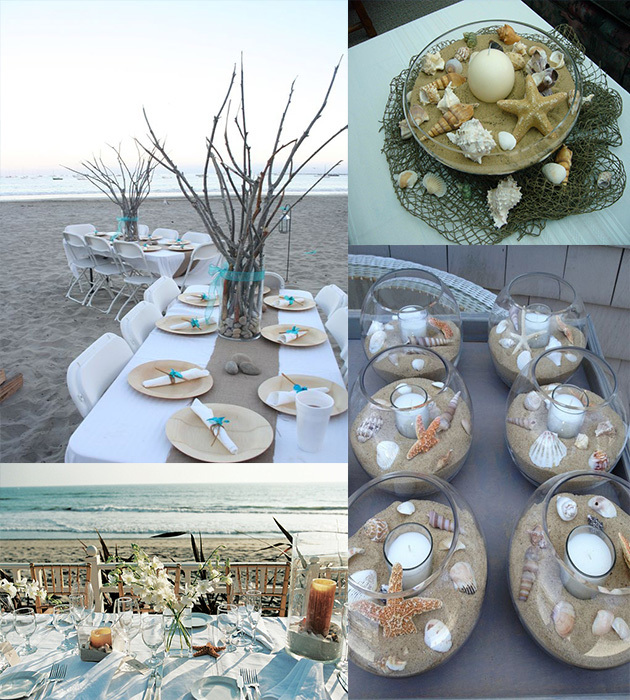 Let the sea become the witness of the wedding with the beautiful beach theme ideas. We are going to show you amazing ideas for decorating a beach wedding party. It will help you in planning and maintaining wedding party. So have a look. 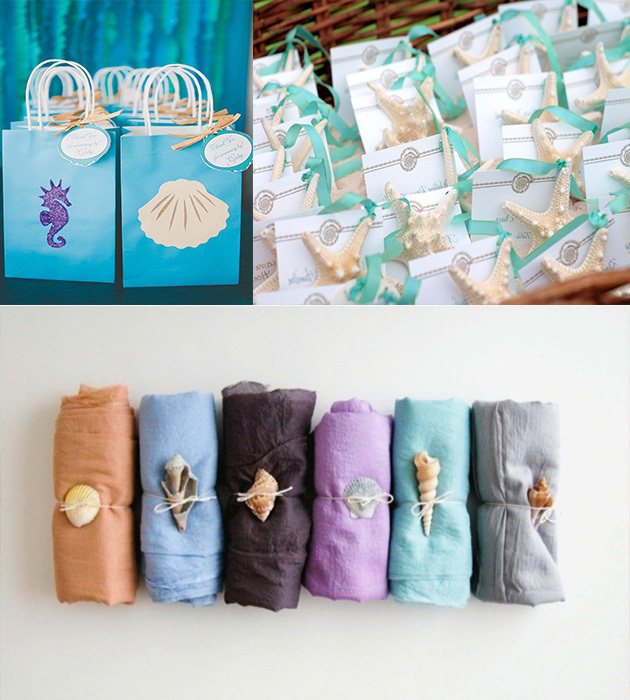 If it is beach wedding then invitation card must be matched with the theme. Invitation card displays the idea of wedding theme. There are countless ideas of wedding beach invitation prints available to buy online. Or you can take the inspiration from net and take the print out of it. Sea waves, the sun set scene in the middle of hills, ship in the shore, waves of blue color and many natural drawing you can print and give the idea of party. Invitation card in the bottle is also fits to give a unique invitation for your guests. Simple and sober white, pink or peach shade tropical wedding dress is perfect for the lady bride. It shows your comfy as well as stunning diva look in the wedding. Pure sea stone or sea pearls jewelry is the best complement to complete the bride attire. While for the groom, light-dark shade of cream color, light blue color, a grey color suit is ideal for a complete makeover. In youths, wearing half pants under the casual white shirt is catching the trend. It’s perfect casual wedding attire for beach wedding theme. A groom can pin the tiny flower bouquet or starfish brooch on the coat top complete the attire. Let the future life partner walk in the most romantic beach wedding aisle. Here you can mix the wedding theme with monogram. Start with covering the aisle with white carpet. Now you can print a monogram on it. On the other side, ombre designs also a good example to brighten and lighten the aisle. Flower decoration on the sides of aisle is a trendy idea to welcome the wedding couples. Or for the simple and sober you can decorate the flower door and simply welcome them walking in the natural sand. Beach wedding table decoration cannot be completed without sea stones and starfish. If you are searching for the best décor, collect the seashells, starfish stone, sea sand and half full the glass and press a candle within. Or you can prepare the couple wine glass wrapped with natural rope, and decorated by gluing seashells. Don’t forget to delight the candle chandeliers to charm the wedding décor. Arrange the dinner table on the venue facing the beach. Beach wedding bouquet can be stored forever in suitcase for the special memento. If you want to make a beach wedding bouquet, you can complete it with starfish and seashells, sea pearls and white and light blue ribbons. You can also bloom it with placing fresh flowers inside. If you want a fresh flower bouquet, a purple orchid bouquet, tropical flowers bouquet, orange, yellow and white flowers bouquet, and calla lilies bouquet are great options. Brooch bouquet is also the best bouquet to save your memories in the keepsake box. Beach wedding cake is set to a mood of beach party fullest. Cake sand colored cake topped with beach chair and sea shells stand to reflect the beach theme party itself. Looking to the delicate decoration a white color cake topped with tropical flowers and rope with anchor decoration delights the mood. You can completely go with sea shell decoration using seahorses, sand dollars, seashells, corals and waves covering the three tier cake. Shiny pearls tied in the three layer cake and topped with shiny sea shells looks stunning. As such there are unlimited decorations you can follow for creating masterpiece cake table. A palm tree bottle opener, a message in a bottle, Flip flop bottle opener, sand and starfish glass coaster, sea shell weight holder, and seashell candle holders are just some unlimited favors ideas. It not only brightens the party place; it is also a good source of giving a gift to groomsmen, flowers girl or to the guests for thank you favor. So here are the stunningly super ideas to make the party look more elegant and fantasy filled. It looks simple but enough to make a big impression on guests. There are so many other ideas like tiny cupcakes in the sea shell, plates of starfish shape and many varieties you can found to complete the party. About this Guest Blogger: Lauren Johnson is a creative writer by passion and marketing professional by profession – a tech-savvy who is currently associated with Giftblooms, an Online Gift Store. For over 10 years she's been working with ecommerce agencies to gain more revenue and better sales. She holds relevant industry experience and writes about Fashion, Lifestyle and Food-Beverages.